Start off your visit on the 3rd (Wed): contemplate the waterfront views at Guaiba Lake (River) and then admire the striking features of Igreja Nossa Senhora Das Dores. For where to stay, more things to do, reviews, and more tourist information, read our Porto Alegre tour builder tool . Use the Route module to find suitable travel options from your home destination to Porto Alegre. 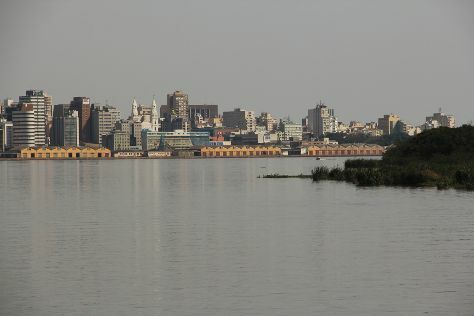 In April, daily temperatures in Porto Alegre can reach 30°C, while at night they dip to 19°C. Finish your sightseeing early on the 4th (Thu) to allow enough time to drive to Bento Goncalves. Your day-by-day itinerary now includes Museu do Automovel - Hollywood Dream Cars, Rhino Antiquario & Cafe and Casa do Colono. Start off your visit on the 4th (Thu): contemplate the long history of Casa do Colono, explore the activities along Black Lake, then pause for some serene contemplation at Catedral de Pedra, and finally examine the collection at Museu do Automovel - Hollywood Dream Cars. Keep things going the next day: do a tasting at Casa Seganfredo, browse for treasures at Rhino Antiquario & Cafe, then walk around Ferradura Park ( Horseshoe Park), and finally look for gifts at Chocolate Lugano. To find more things to do, maps, ratings, and other tourist information, you can read our Gramado tour planner. Traveling by car from Porto Alegre to Gramado takes 2 hours. Alternatively, you can take a bus. Finish your sightseeing early on the 5th (Fri) to allow enough time to drive to Bento Goncalves. You've added Vale dos Vinhedos, Cristofoli Vinhos de Familia, Vinicola Salton, and other attractions to your itinerary. It doesn't end there: contemplate the long history of Caminhos de Pedra. To find traveler tips, where to stay, more things to do, and more tourist information, read Bento Goncalves visit planner. Traveling by car from Gramado to Bento Goncalves takes 2 hours. Alternatively, you can take a bus. On the 8th (Mon), wrap the sightseeing up by early afternoon so you can drive back home.